Standing shoulder to shoulder, two Sector Sub-Assembly tools will suspend the vacuum vessel sectors from the top while carefully positioning and installing—via the rotary motion of the "wings"—the vacuum vessel thermal shielding and two toroidal field coils. 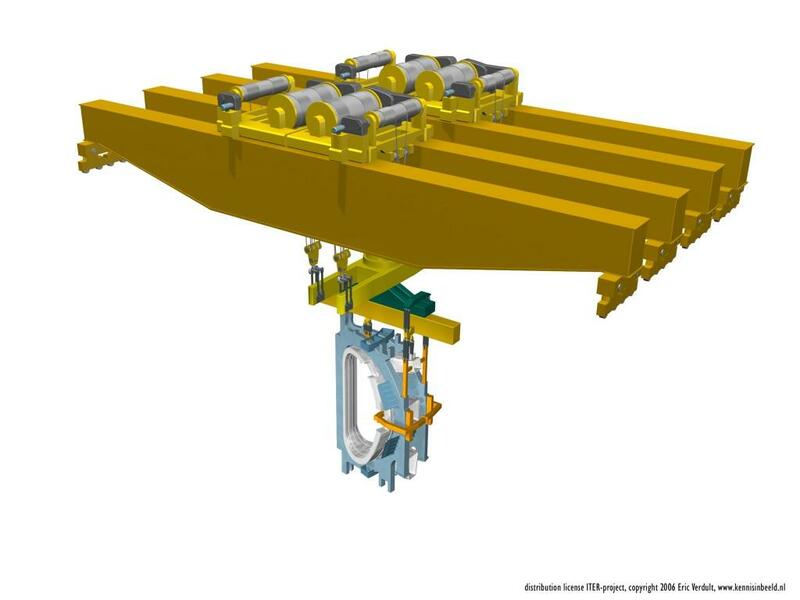 In their tandem configuration of two trolleys carrying two 375-tonne cranes respectively, the ITER bridge cranes will be capable of lifting loads of up to 1,500 tonnes. Most of the ITER components with large diameters, like the poloidal field coils or the cryostat segments, will be handled by the synchronous use of four universal lifting beams connected to as many 375 tonne crane hooks. Each vacuum vessel port component is assembled and aligned by the dedicated assembly tools, equipped with high-precision hydraulic units and motors. 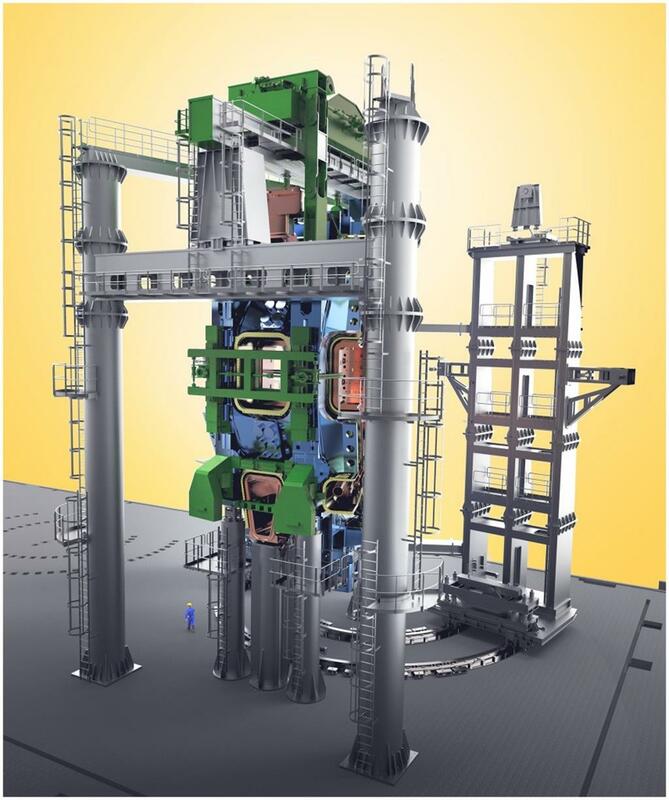 This 22-metre-high Sub-Assembly Tool will assemble components weighing a combined mass of 1,250 tonnes: one 40° vacuum vessel sector; two toroidal field coils; and thermal shields. Most of specialized purpose-built tooling for ITER assembly will be supplied by Korea, as part of its procurement commitments to ITER. Appropriately termed the "upending" tool, this specialized tool will lift the 40° vacuum vessel sectors from the as-delivered horizontal orientation to vertical orientation for sub-assembly with two toroidal field coils and thermal shields. This tool will also be used to upend toroidal field coils. In order to successfully manoeuver hundreds of very large Tokamak components into position, a very precise, made-to-order set of tools is currently under construction. 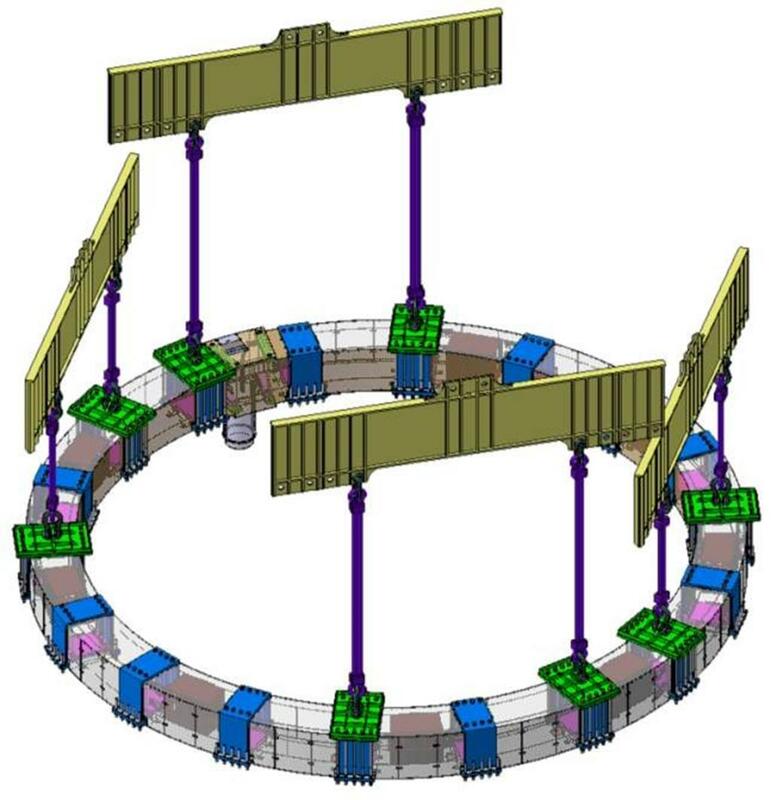 The lifting system will be comprised of a pair of independent bridge cranes mounted on rails that run the entire length of the Tokamak and Assembly buildings to form a continuous, 175 metre-long crane bay. Working together, the four 375-tonne main hoists will handle loads of up to 1,500 tonnes. The central solenoid—the magnet in the centre of the machine—will be the tallest lift of assembly operations (18.2 metres). The heaviest single load will be the base section of the cryostat, which weighs in at 1,200 tonnes. In some cases, components standing 20 metres high and weighing hundreds of tonnes will have to be manoeuvered into position within tolerances of 2-3 millimetres. A special "sub-assembly" tool will suspend each of the nine sectors of the vacuum vessel from its top, install associated thermal shielding, and rotate two toroidal field coils into position. Standing 22 metres tall, the "sub-assembly" tool will weigh 700 tonnes and be able to handle combined loads of 1,250 tonnes. 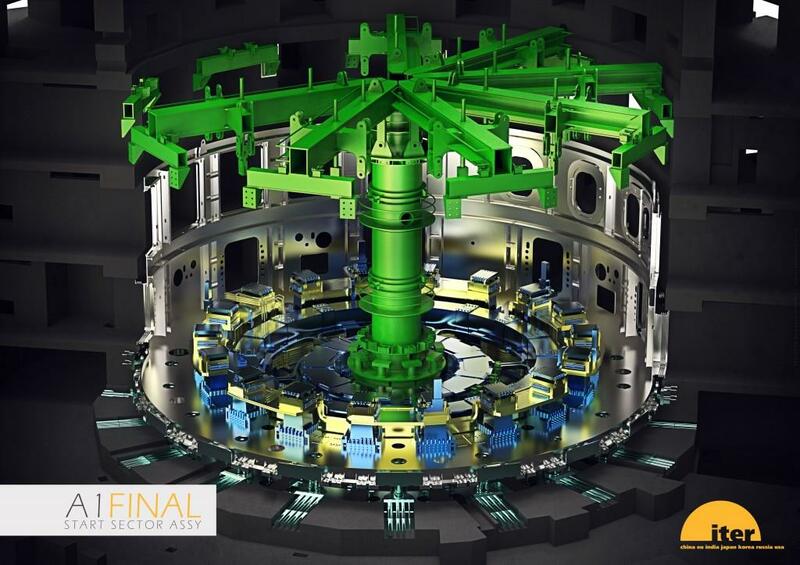 This procedure will be repeated consecutively to achieve nine sub-assemblies, which will be transferred into the Tokamak pit for the final sector assembly. 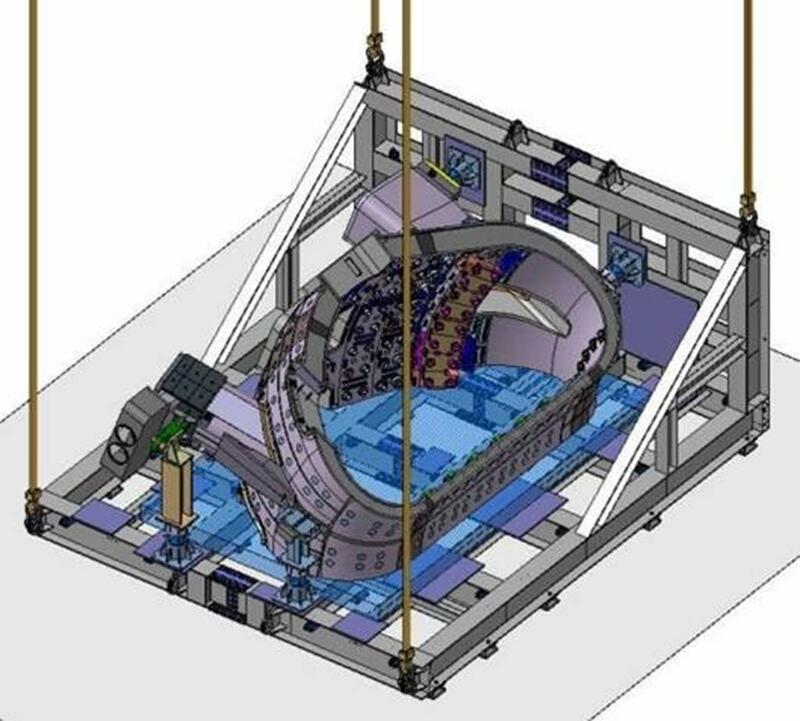 Two sub-assembly tools will be manned concurrently (fed from one upending tool) to optimize assembly operations. In all, 128 different types of custom tools will be required to assemble, lift and finally manoeuver ITER's supersized components. 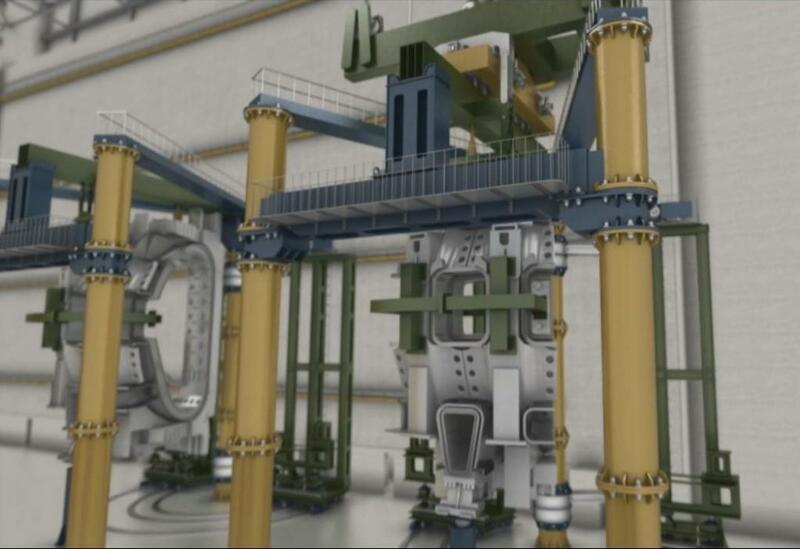 The tools will have loading capacities that vary from 500 tonnes for the "upending" tool that will turn vacuum vessel components from horizontal to vertical, to 1,500 tonnes for the heavy lifting tools used to lift the sub-assembled sectors into the Tokamak pit for final assembly and welding. 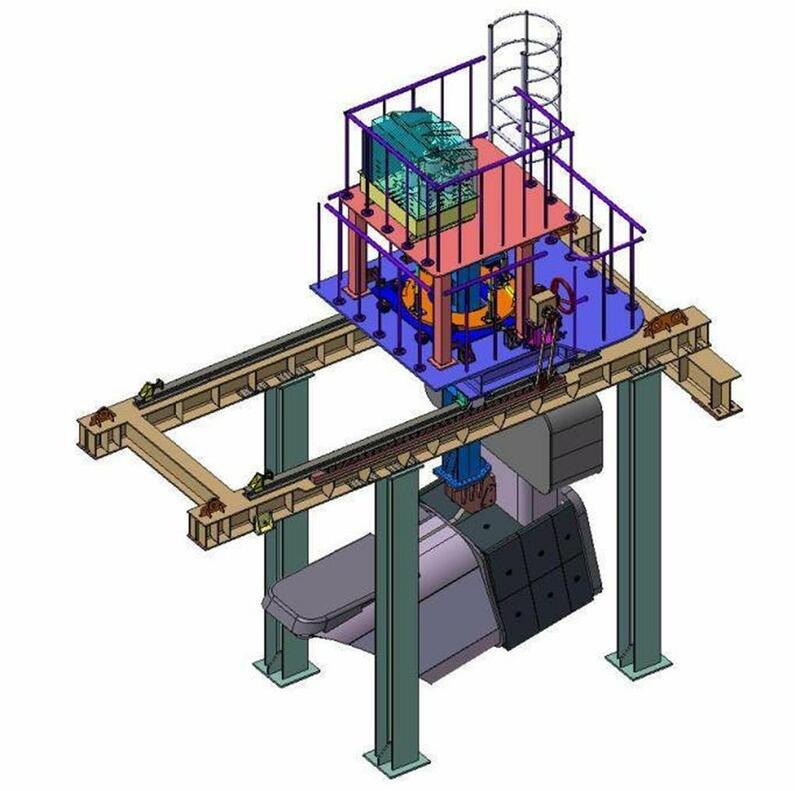 There, the largest purpose-built tool, the in-pit assembly tool, will grasp all nine sectors together (3,800 tonnes) in order to align the vessel structure. Following main assembly and alignment of the vacuum vessel, the second assembly phase—the installation of in-vessel components—can proceed with the specialized remote-handling devices.